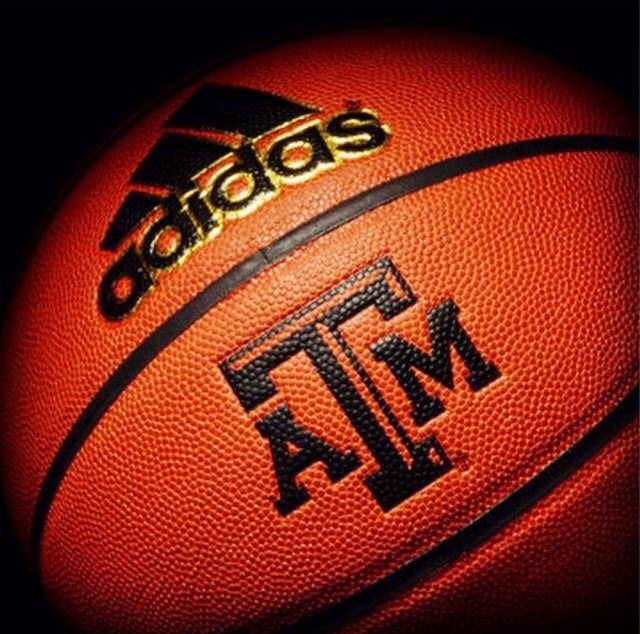 This past month has been primarily an evaluation period for those in the college game with two full weeks travelling the country looking for players that best fit our Aggie family. As someone that cares about the game, observing the competition in the summer can by uplifting or disappointing depending upon the team and players you are watching. It's a lot of pressure on these young women because they know that a summer performance can often preclude their future options. Truly a lost art. When's the last time you said to yourself, "that player is excellent as shot and pass fakes." Of course part of the responsibility belongs to us as a coaches -- are we teaching and emphasizing it? Few things can help an offensive player more than the proper use of a pass fake and a shot fake. Sounds a little silly saying "know the plays" but it's amazing to see a player or two who doesn't know where they are supposed to be or what they are supposed to being doing. 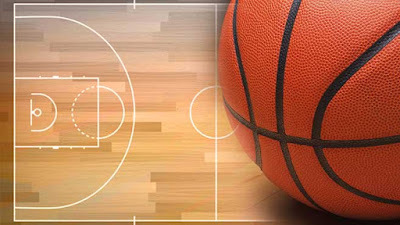 Whether is an inbounds plays, a half-court set, a motion entry or anything else structured, take the time to know where you are supposed to be and what you are supposed to be doing. Next is execution -- doing it when you are supposed to and as well as you can. This does not take talent but commitment to knowing and understanding your team's playbook. Again, seems like it shouldn't have to be said but it does. And here is the key to playing hard -- you have to do it all the time...not just when your team's ahead or the play is called for you. Playing hard means that you are making all your cuts in your offense hard. It means that you are sprinting to screen. It means that getting back on defense is a full speed proposition. Be the player constantly encouraging their teammates...picking them up both physically and emotionally when the time comes. Don't be the player with the horrific body language when a teammate turns the ball over as if you were saying "I wouldn't have made that mistake." If a played does make a mistake, correct it is a positive manner. Forcing shots does not help your team nor does it impress a college coach. Know what a good shot is for you -- and yes, your shot selection will vary from those of your teammates. Don't hunt shots, let the shots find you. As I heard Nick Saban once say, "Wherever your shoes are, be there." Don't wonder mentally. Stay focused to the job at hand. Be a process oriented player. Don't worry about the past play -- it's over. Don't worry about a play in the future they may or may not happen. All you can control is the current possession you are involved with -- give the possession complete concentration. This actually can do a long way to helping with concentration. In timeouts are you locked in with your eyes and ears. Does you coach have your complete attention. There's a free throw situation and your coach or captain is barking out instructions. Are you actually listening and processing or just hearing -- and there is a difference between listening and hearing. Without doing anything in regard to skill work...without saying anything about your talent level...you can make an impact on your team by being in great physical shape. When the game is in the fourth quarter or late int he second half and everyone else is starting to drag, this is where you can make a difference. Not only will you be a step faster because of your conditioning level, but you will be mentally sharper as well. How many times have we seen a team put on a late run and in large part because of players that are in just better shape that run the floor and past their opponent. Again, these have nothing to do with skill or talent but they are game changers. The three areas that players can control (but often choose not to) are: attitude, energy, enthusiasm. Now I'm not saying it is easy but if you want to make a difference in your team its well work working on. By controlling your intangibles, I mean you don't let officiating, teammates, opponents, coaches, gym conditions or anything else effect you having a team-first attitude, with high energy and positive enthusiasm. What do your teammates see when they see or think of you? He or she is always early to the gym. They stay late. They are on time for meetings. They listen to the coach. They keep their composure. Off the court they conducting themselves the right way. They maintain a proper diet to put fuel in the tank. They are positive talkers -- not criticizing a coach or gossiping about a teammate. Some of the best rebounders are lacking in talent and athleticism -- they board well because of effort and tenacity. Rebounding is one of the only areas in basketball where it's alright to selfish. I've coached for over 35 years and have never heard of a coach taking a player out for rebounding too much! I would imagine some of my coaching friends can add to this list but the key for players to understand is that every player can adopt these principles and it will make them a better player and their team a better team. There's nothing on here that requires you to jump higher, run faster or have an amazing handle. Be committed to areas that you can control and work towards being the best you can in those areas. Note: Walk-Ups the day of the Academy are welcome. Simply email me at: rstarkey@athletics.tamu.edu so we can hold you a spot. We are excited to announce the Mike Neighbors will be our guest speaker at the 5th Annual Gary Blair Coaching Academy. 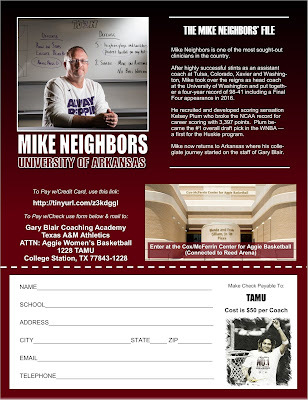 Mike recently returned "home" to resurrect the University of Arkansas women's basketball program. He arrives in Fayetteville after an outstanding four-year run at the University of Washington that showcased a four-year record of 98-41 and included a Final Four appearance in 2016. While coaching the Huskies, Mike recruited and developed the NCAA's all-time leading scorer in Kelsey Plum. 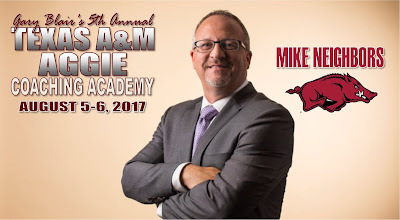 Mike will have two sessions at the Academy. His on-floor demonstration will be on his "Green Light Shooting Series." His classroom lecture will deal with the challenges of teaching the iY generation. 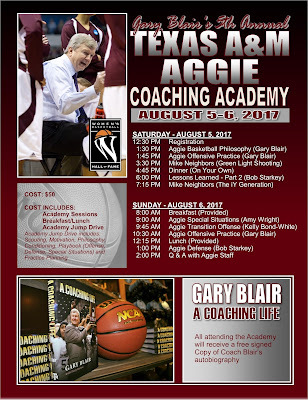 This August our team will be playing 4 games in Spain which means the NCAA will allow us 10 practices….we will utilize this as part of our Coaching Academy which means you will see how we teach and prepare and get an inside look at several facets of the Aggie program. All attending the Academy will received an autographed hardback copy of Coach Blair's new book, "A Coaching Life." We are attaching a flier with detailed information and a form should you want to pay by check. For those coaches wanting to pay by credit card, simply click on this link. Those that know me or follow our blog know of our great respect for Kevin Eastman and the responsibility he has assumed in helping us become better coaches. Last year we brought Kevin in to speak to our team and he had an amazing impact on our Aggies. His message is dynamic and tailored to your team. I highly recommend you look into bringing Kevin to your campus -- regardless of what sport you coach. Now Kevin has a new venture -- Elite Training Camp -- designed again to help coaches reach another level. If you've attended any of the Coaching U Clinics you can only imagine the level of instruction that you will receive at this event. Yet another example of Kevin looking to help us? This 30 minute video "Q's for Coach." I've watched it twice -- taking notes the second time. Yesterday, while speaking to various teams at are team camp, I never fail to talk to them about the great power in the world -- the power they have to chose their attitude regardless of the circumstances. We talk about how we all have this ability and when we discover it and then nature it, we can accomplish amazing things. We really do have the power to write our own story. 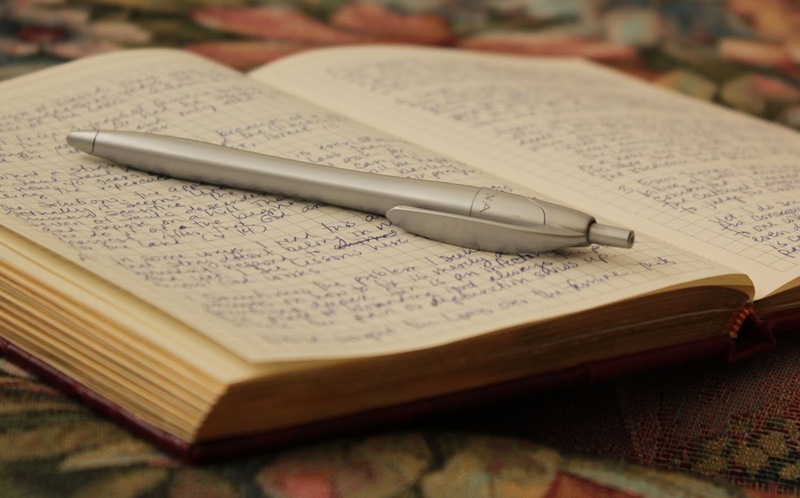 A few years ago, we had Abby Jump write a guest blog post for us on the lessons she had learned on the recovery process of a seven-month rehab due to a severe injury. It was an amazing post you can go back and look at here. She recently reached back out to us and wanted to share her notes from a talk that Coach Don Meyer had gave to her team about eight months before he passed. They are excellent Abby -- thanks for sharing! I was fortunate enough to meet Coach Don Meyer eight months before he passed prior to my junior season at Wright State University. Our team quietly sat for hours listening to Coach Meyer talk about characteristics of great players and teams, things he had learned through winning and losing, and life lessons. Before meeting Coach Meyer, I knew I wanted to be a college basketball coach and I was encouraged to write down everything he had to say. All that came out of his mouth was so golden to me as a player and future coach that I couldn’t move my pen fast enough. I ended up writing seven pages filled of notes and probably could’ve written more if my hand wouldn’t have went numb! To this day, I refer back to these notes daily in helping me become a successful assistant coach, mentor, colleague and friend. I find myself flipping through a composition notebook nearly five years old in times of success, tragedy, stress and when I just have a ‘what would Don Meyer say?’ moment. Every morning I have a 6-pack. Not what you’re thinking! A 6-pack of goals for the day. It allows me to stay committed and productive. Have a fox hole list of trustworthy players who you would want beside you in the hole of distress. Your example is not the main thing in influencing others, it is the only thing! Don’t make decisions because they’re easy, popular or convenient. Make them because they’re right. The hardest decision to make is the right one. 1. What is your talent that is unique? Find it. 3. Give your gift away every day. Have adrenaline for your job every day! Some coaches aren’t nearly as affective at the end of their career because they can’t handle the additional stress. They don’t have the energy that they h ad in the beginning of their career. 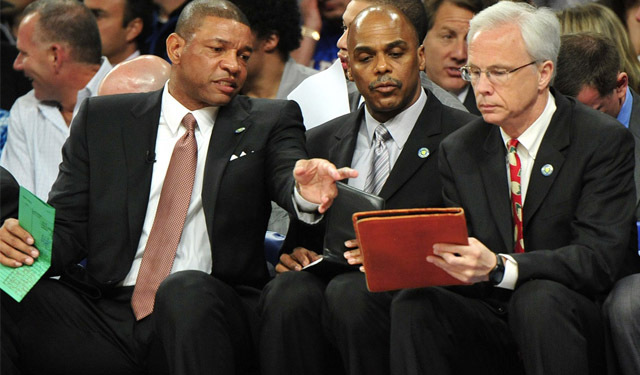 You have to be sick for coaching – Love every second. You have to love what you do every single day.